Like all of the students involved in the Puente Project at Lee College, future physicist Hugo Anguiano and budding engineer Verenice Valencia received incredible support on their journey to an associate’s degree and beyond: help with academics, scholarship money, connections with professional mentors, exposure to new cultural experiences and a deeper understanding of their Latino heritage. 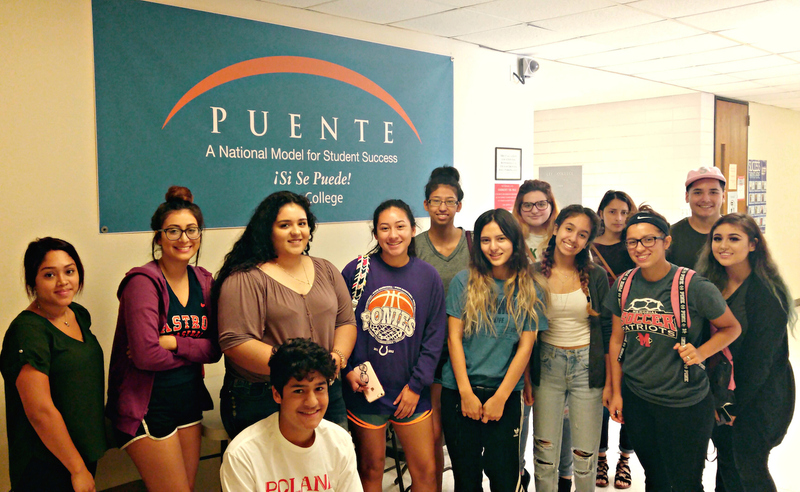 Students in the Puente Project at Lee College receive academic support, community mentors, opportunities to visit universities and cultural sites around the state, and an in-depth exploration of Latino history and heritage. The program is seeking professionals to serve as mentors to the newest Puente enrollees. From left: Yesica Flores, Stephanie Moreno, Lizbeth Bejar, Mitchell Medrano, Andrea Gallegos, Prescilla Sanchez, Xochitl Cortez, Corie Cole, Cierra Marron, Yoselin Velasquez, Deborah Ridley, Jose Pulido, and Jasmine Cardenas. But it’s the feeling of having a second family on campus — a Puente family bonded by the shared goal of completing their education and achieving their dreams — that has meant the most of all. Lee College was the fourth community college district in Texas to host the Puente Project, which aims to increase the number of under-served students who transfer to four-year colleges and universities, earn college degrees and return to their communities as leaders and role models for new generations. Approximately 42 percent of students enrolled at Lee College are Hispanic/Latino, earning the college a federal designation as a Hispanic-Serving Institution. Through Puente, Latino students are provided with academic support centered on integrated reading and writing, English and an introduction to Mexican-American Studies. They visit universities around the state, like the University of Texas and Sam Houston State University, and are invited to participate in academic conferences and unique social and cultural events, like the annual “Noche de Familia” and Dia de los Muertos celebrations. Puente students have also been involved in highlighting the contributions of the Latino community in Baytown, even painting a mural at Sterling Municipal Library that depicted the stories of those who made an impact on Latino and multicultural history in the region. Puente students are also paired with community mentors who share their professional and academic experiences while motivating the students to reach their goals. All Puente mentors are professionals who have earned a college degree and committed to spending at least nine hours per semester interacting with their mentees. Those who are interested in serving as mentors are invited to a training dinner set for 6-8 p.m., Wednesday, Oct. 5, in the Bayer Conference Center on campus. And although Anguiano has benefited from his relationship with his mentor and the instructors and staff who keep Puente going, he has also learned how to be a better student and leader. When he earns his doctorate degree, begins conducting research in particle physics and quantum theory and starts finding answers to the age-old questions of the universe, he will remember how the Puente Project at Lee College made a difference. For more information about the Puente Project at Lee College and the upcoming mentor training, contact Sarah Steinkopf at 281.425.6808 or ssteinkopf@lee.edu. BAYTOWN, TX — After making a pledge to raise awareness about the environmental damage caused by littering and the importance of beach conservation, students in the Puente Project at Lee College are planning to clean up a section of Crystal Beach in Galveston County. The first-of-its-kind “Puente Clean Beach Crusade” will begin at 10 a.m., Friday, May 6, on South Crystal Beach Road in Crystal Beach. The students invite volunteers to join them and show the positive impact that can be made when the community comes together for a worthy cause. The clean up will also demonstrate that young adults are committed to preserving the environment for future generations to enjoy, according to Puente student Javier Barajas. The students intend to make the crusade an annual event and hope to increase knowledge of the harm humans can inflict with their trash. The Puente Project at Lee College aims to increase the number of underserved students who transfer to 4-year colleges or universities, earn college degrees and return to their communities as leaders and role models. Latino students are provided with academic support centered on integrated reading and writing, English and an introduction to Mexican-American Studies; connected with community mentors; and exposed to new cultural experiences. For more information about the Puente Clean Beach Crusade, contact Barajas at 760.658.4834. BAYTOWN, TX — Students in the Mexican American Studies program at Lee College will unveil a new, hand-painted mural next week at Sterling Municipal Library that draws on the history of Baytown and depicts the stories of those who have made an impact on Latino and multicultural history in the region. The mural will be revealed in a special reception set for 6-8 p.m., Wednesday, May 4, in the library conference room. The event is free, open to the public, and being presented in conjunction with the Puente Project at Lee College and with the cooperation of Sterling Municipal Library. A group of 8 students created the mural for “HUMA 2319 – American Minority Studies: Chicano/Latino Art,” an interdisciplinary Mexican American Studies course that examines the diverse cultural, artistic, economic, historical, political and social aspects of minority communities in the United States. Students in the class have explored topics ranging from race and ethnicity to gender, socioeconomic class, sexual origin, and religion. Much of the public art created in recent years has been more graphical in nature, said Orlando Lara, instructor of the HUMA 2319 course and lead faculty member for the Mexican American Studies program. By contrast, Mexican muralists of the 1920s and 1930s — and later Chicano muralists of the 1970s and 1980s — created artwork that experimented with social and political content. He hopes the students’ mural will begin to bring back the more social and political aspects of art. Felicite Herrera said creating the mural has given her and her classmates the opportunity to send a message and make people see what is happening in their city. “It’s about empowering everyone and not letting Mexican-American and African-American history be erased,” she said. For more information about the mural unveiling or the Mexican American Studies program at Lee College, contact Lara at 281.425.6431 or olara. Lee College offers more than 100 associate degree and certificate programs, as well as non-credit workforce and community education courses, that prepare its diverse student body for advanced higher education; successful entry into the workforce; and a variety of in-demand careers. With the main campus and McNair Center located in Baytown, Texas, and a satellite center in nearby Liberty, the college serves a geographic area of more than 220,000 residents that includes 13 independent school districts. To learn more, visit www.lee.edu.